Coldplay, British rock band, made a chart-topping video with ‘Speed of Sound’, the first single to be released from the X&Y album. The ‘Speed of Sound’ video debuted on MTV on May 23. It came very close to winning the 2005 MTV Video Music Awards, making it to the list of the six nominations. What made this video stand out? It was the connection between voice and lighting. Speed Of Sound was written by Coldplay members Guy Berryman, Jonny Buckland, Will Champion and Chris Martin. The video was directed by Mark Romanek, known for ‘One Hour Photo’ and award-winning music videos. From Stephanie Jorgl’s feature at Apple we learn that Mark Romanek’s music videos have earned over a dozen MTV awards, two Grammy awards, three Clios and three Billboard Music Awards. Two of his music videos — Madonna’s “Bedtime Story” and Nine Inch Nails’ “Closer” — are part of a permanent collection in New York’s Museum Of Modern Art. In 1997 MTV gave Romanek its Video Vanguard Award for his contribution to the medium. The video Mark did for Johnny Cash’s cover of the Nine Inch Nails’ song, “Hurt” was nominated for 6 MTV video awards in 2003. Mark worked with film production company Anonymous Content. The producer was Aris McGarry. Director of photography was Harris Savides. Editor was Adam Pertofsky at Rock Paper Scissors. Production designer was Laura Fox. Stylist was Maryam Malakpour. 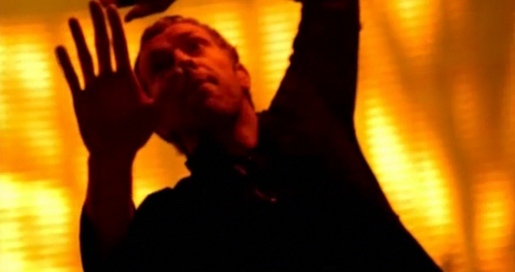 The on-set animations were programmed and performed live during the shoot, using Chris Martin’s voice to create unique visual waveforms that were mixed with original visual content created by V Squared Labs. ‘Synesthetic visual art’ was created by V Squared’s Vello Virkhaus. The LED screen was designed by Michael Keeling of Project X. Show programming and visual playback was handled by Martin Philips. The Versa TUBE units were provided by Element Labs. Visual effects were provided by A52, whose Inferno/Flame team included Patrick Murphy, Tim Bird, Justin Blaustein and Ben Looram. Producers were Mark Tobin, Ron Cosentino and Scott Boyajan. The ‘Speed of Sound’ video was nominated for best video in the MTV Music TV Awards held in Miami in 2005. 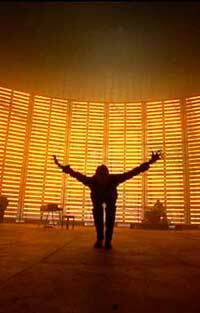 There’s no clear consensus on the significance of the words to Speed of Sound. The song starts with the sense of disorientation that comes from the uncertainty associated with an ambiguous relationship. The words of the chorus could be referring to the sense of orientation to the coast migratory birds gain from their capacity to hear infrasonic sounds from breaking ocean waves. If you’ve never tried, then you’ll never know. to show it how all began. Some things you can’t invent. Oh, when you see it then you’ll understand?